Bengaluru FC fans turned up in record numbers to witness the kick-start of their Hero Indian Super League (ISL) history with a confident win over Mumbai City FC at the Kanteerava Stadium in Bengaluru on Sunday. Such was Bengaluru’s attacking prowess that a 2-0 score line flattered the visitors as 17,796 fans bounced in the stands to start a new era for the former Hero I-League club. Mumbai City FC managed to see off a flurry of corners up until the 67th minute, when Bengaluru worked one short to see Edu Garcia cut inside on to his left foot to send a low shot past Amrinder Singh’s near-post. Sunil Chhetri then capitalised on a mistake from Mumbai ’keeper Amrinder and defender Mehrajuddin Wadoo to score the second in added time. The India captain didn’t celebrate against his former club but certainly deserved his name on the score sheet. But while Alberto Roca will be pleased with the cohesion his side showed, he will be worried with the number of chances they wasted. Venezuelan striker Miku was the recipient of delightful through-balls from both Sunil Chhetri and Udanta Singh, but failed to make any of his opportunities count. Chhetri and Udanta were particularly impressive, threatening to break forward with speed and intelligence. Both teams may have gone 0-0 at halftime despite Bengaluru creating a host of chances in the first 30 minutes. Chhetri saw the first glimpse of goal from a Miku cross but his first-time side-footer whizzed over the bar. The skipper then wove his way from the left to pull one back for Miku, but it was cut away before the striker could pull the trigger. Chhetri also put Udanta Singh down the right channel but the explosive winger’s shot soared over the bar. Amid all this, Mumbai City defender Rozario was lucky enough not to be sent off for a blatant forearm slash on Udanta. Mumbai City FC managed only one shot on target, with Gurpreet Singh having little to do apart from bat away some deep crosses. 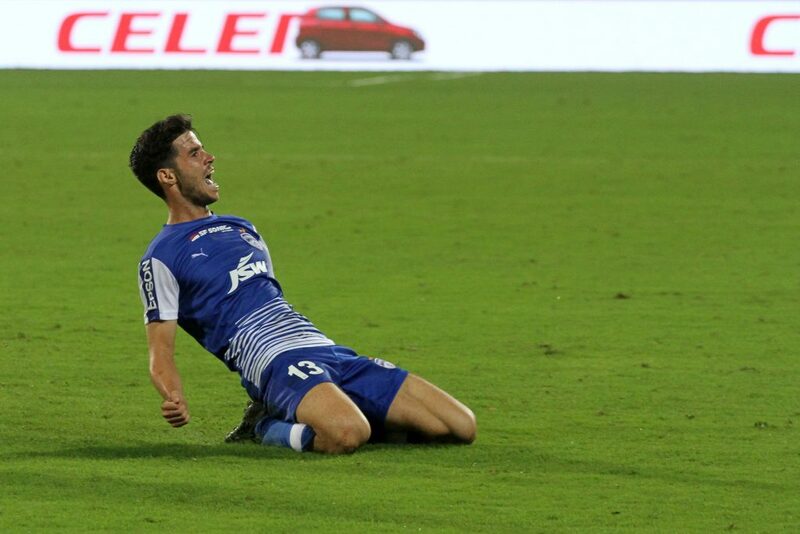 Last year’s table-toppers got their best chance in the 54th minute when Everton Santos twisted and turned to open his body for a right-footed shot, only to see it blocked by a resilient Bengaluru defence. Mumbai City’s fans will take heart from the fact that they were playing against the most settled and experienced side in the Hero ISL – given that this Bengaluru side has already played competitive football in continental competition. But that will only be a consolation – Mumbai City looked clueless going forward at most times and will need to do better to replicate last year’s performance.